Channahon School District 17 is transitioning to Standards-Based Grading! The following resources provide more information on standards-based grading. If you have additional questions about SBG, please contact the school principal. What is the difference between standards-based grading practices and traditional grading practices? 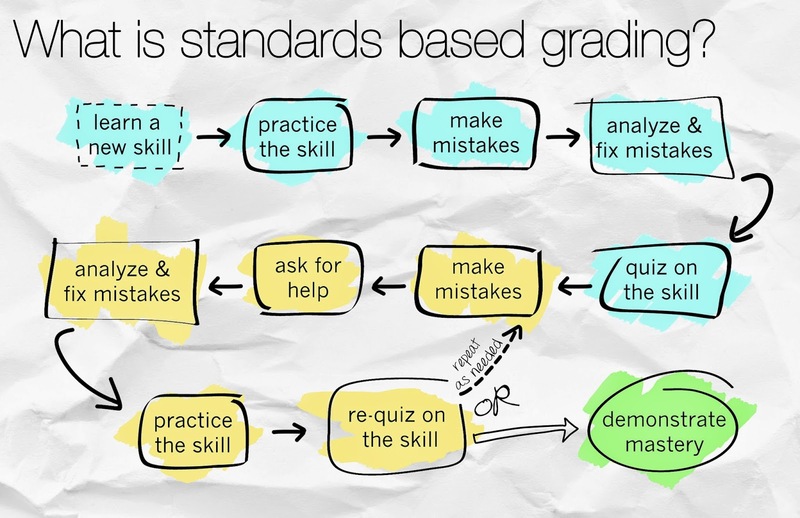 Standards-based grading communicates only mastery towards a standard whereas in traditional grading other factors are included such as practice, neatness, timeliness, attendance, and behavior. For example, a student who demonstrates proficiency on a math standard is able to demonstrate his or her understanding of the content and it is not because of extra credit, homework, and/or participation in class. This change causes the reporting of what students know to be much more accurate and meaningful. Non standards-based information is important and it will still be reported to parents and students, but these factors do not tell us if a student has demonstrated proficiency on a standard. Grading based upon performance standards increases learning clarity and achievement. What is the purpose of report cards/grades? The purpose of report cards/grades is to communicate students’ proficiency level/mastery of a standard(s). The goal is to provide accurate, timely, specific, and fair feedback that communicates exactly where a student is in his/her learning. How will I know if my child is successful or if he/she needs more support? At different times throughout the year and in different standards and content areas students may fall anywhere upon the continuum of learning. Performance will be expressed on report cards as: Limited, Progressing or Meeting standards. If your child is receiving a marking of ‘limited’ on the report card it is an indication that more support is needed on that particular standard. What role does homework play in determining a student’s proficiency level? How is homework used to assess students learning? Homework is a means for students to practice and reinforce and gauge progress towards their learning. However, homework is not be a reliable indicator of student achievement and therefore will not be utilized when determining a student’s proficiency. Students will receive feedback on their homework and completion of it will be monitored. Since homework and other factors are not included in communicating a student’s proficiency, how will parents know how a child is doing in class before reports come home? Standards-based grading allows teachers to clearly see whether a student has mastered content through the use of regular formative assessment (monitoring student learning in real time). Teachers will communicate that learning back to students and parents. Formative assessment allows educators to adjust teaching to meet the needs of the learners. A variety of methods may be used to communicate student progress to parents including: online management systems, student portfolios, progress reports, email updates, teacher websites and regular phone calls. We also encourage you to establish a system of communication with your child(ren) to help them monitor their own progress towards meeting the standards. Can a student be advanced in the first reporting out period? Yes. Students are only being assessed on the material that has been covered during the reporting out period. If a student has demonstrated an advanced level of learning on the material, they are considered advanced. Teachers will support these students through differentiation (the customization of a meaningful learning plan) for all students to meet their specific needs. Therefore, each child can be expected to be challenged in class and to learn new information regardless of their knowledge of the content. What is the school district doing to help teachers refine their reporting practices? Channahon School District 17 is committed to standards-based grading. Teachers have been meeting in grade-level teams to identify those learning standards that must be assessed and communicated. International expert, Rick Wormeli, also visited District 17 in the fall of 2015 to provide professional development. Grade level and building level teams continue to meet to refine assessments using student data. What about SBG and student awards at Channahon Junior High? Staff in grades 6-8 transitioned to a full standards-based reporting system in the fall of 2018. Graduation honors given at CJHS, such as the Indian Scholar, continue to be awarded. The transition to SBG was a multi-year transition. As of the fall of 2018 Grades K-8 have transitioned to a standards-based reporting system. With that said, these report cards will be continuously improved as our knowledge improves.